Logitech has just announced a new collaboration with Amazon Alexa that will bring the world of voice control to your vehicle, enabling you to access and adjust your smart devices while out on the road. Logitech ZeroTouch is the product of that union, a magnetic dashboard mount and app combo that uses your smartphone via Alexa to enable you to control everything from thermostats to smart speakers - all with the power of your voice. This being Alexa-powered, you can use ZeroTouch to compose text messages, access music streaming, set navigation destinations and more. 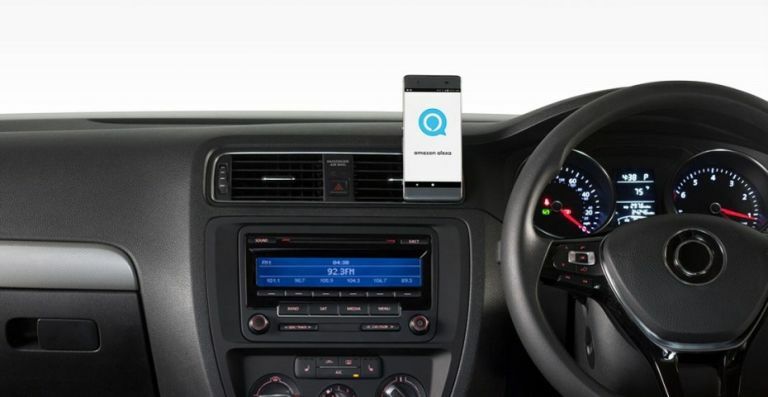 It's an Android only device and comes in an dashboard mount version (available for £59.99) and an air vent version (£49.99) at Carphone Warehouse. In fact, it's currently half price so get once ordered today. Talking of Alexa, the Amazon-powered voice control assistant is about to get even more useful thanks to the arrival of Control4 functionality. The high-end home automation firm is famed for creating receivers that control multiple smart devices in your home (or 'scenes') and its now bringing that mass device manipulation to UK Alexa users. So via either Alexa or Alexa Dot you can now set up scenes with everything from Blu-ray players to thermostats and ensure your favourite rooms are set up and ready for you every time you're ready to sit down and relax/work. Control4 receivers start around £400, with an additional annual fee of £79 also included as part of the firm's 4Sight service. It might sound like a lot, but that extra service means Control4 will ensure all your smart devices and scenes are ready and functioning whenever you need them. Following the introduction of 4K and HDR content last year, YouTube is preparing to roll out the next big change to its streaming functionality, offering the ability to perform live streaming from a mobile device and chat live with viewers. The Mobile Live Streaming and Super Chat features will be made available to any YouTuber with 10,000 or more subscribers as the video content site continues to battle Twitch for control of the streaming crown. If you're a fan of Facebook Live then Mobile Live Streaming will feel immediately familiar and easy to use. That aforementioned Super Chat feature is there to help users monetise their streams - viewers can pay to make their posts stand out from the rest, as well as the option to 'pin' their message to the top of the chat for up to five hours. Aiaiai is preparing to launch a brand new audio experience to help users build the perfect TMA-2 modular headphone - one that's exactly suited to their musical tastes. TMA-2 Discovery takes the TMA-2 Modular Headphone System (which has now grown to over 1,000 different combinations) to the next level by using Spotify's personalised Discover Weekly playlist that picks music based on your listening habits. The program, which can be easily accessed online (you'll just need to make sure you have a Spotify account and an active Discover Weekly playlist) enables you to see the tempo, bass and mood of your favourite musical choices and presents a modular setup that suits it. The experience is live right now, so head on over, connect it up to Spotify and see which TMA-2 Modular Headphone System is the right one for you.